Acadia National Park is the oldest National Park east of the Mississippi River, established in 1919. Cadillac Mountain shown above is the highest point on the Island and has great views in all directions. About 1/2 of Mount Desert Island is inside the National Park. In all of our many Lighthouse visits this is the first time that the Lighthouse Keepers house was still in use. Another part of Mount Desert Island is the harbor and village of Bar Harbor. Bar Harbor is a true “tourist town”; a lot of Motels, B&Bs, place to eat and T-shirt shops. During our second week at Bar Harbor the Island Shuttle system started its Summer Service. It is an absolutely free amazing service that cover the entire island. The bus came right into our RV Park to pick us up. Although the buses have many regular stops; outside of the actual village of Bar Harbor shuttle bus will also drop you off and pick you anywhere that you request. Since parking both in Bar Harbor and at the various scenic points and trail heads is at a premium it was great to have this service available for everything from getting groceries, going to church and going on hikes. The buses also have bike racks and they have a special “bikers bus” that pulls a trailer that carries bikes to the bike and carriage only roads. As we found out in Zion National Park last fall bus shuttle service make for great point to point hiking. This brand new perfectly straight boardwalk continued on for 1/2 mile on one of our hikes. We spent 4 weeks in Maine and it is now our favorite state east of Rockies. Maine has an amazing amount of water, they have miles of huge rives and lakes. Near where we stayed in Augusta there is Long Pond. This “pond” is 2 miles long and 1/2 mile wide. Shockingly what we didn’t see were any fresh water birds at all! Not even Mallards, Canada Geese or even American Coots. We did see a couple of Bald Eagles and one Great Blue Heron. Maine has 3,000 miles of shoreline but, we didn’t see any shorebirds at all. I can understand that the Maine shoreline is very rocky and may not be the best place for shorebirds. However, I would have thought it ideal for Turnstones and Oyster Catchers. We did see a few of the following birds: Common Eiders, Great Black-backed, Bonaparte’s Gull, Herring Gulls, Great and Double-crested Cormorants, on the ocean and bays. However, considering the amount of ocean and the number of bays and coves we really didn’t see many birds. The bird that seemed to be everywhere and singing while we were on Mount Desert Island was the American Redstart. Gordon took me to Bar Harbor for my 40th birthday (some time ago). We went on the off season, 1st week of September. We loved it there! Thanks for the views from Cadillac Mountain and the beautiful Maine shoreline pics! Stunning! It is interesting that you didn't see very many shore birds. 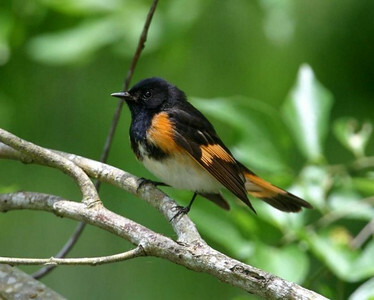 The American Redstart is very pretty. We've never seen that one. I can certainly see why Maine is now your favorite state east of the Mississippi!! The top of Cadillac Mountain has one of my favorite views! Thanks for the memory. You sure brought back some lovely memories for me! My family "helped" sail one of those boats! Fun times, fresh air, and beautiful scenery all the way around in Maine! I bought pine inscence in NY just to remind me of my times in Maine! What a beautiful, beautiful place!!! I have never been to Maine, but after seeing your pictures, I'd like to visit. Beautiful...I want to go back. I want to move to MAINE. OH my that is the bluest water I've ever seen. Maybe because the trees are so green but it is gorgeous. Happy trails to you all great commentary too. Brings back memories of my two summers there, working at the shops on Cadillac Mountian & at Thunder Hole. I wonder are the shops still there? You're right, not too many shorebirds on all those rocks - best place I found for shorebirds was the bar at Bar Harbor. Looks like you've been all over the island...have you done the little trail to Wonderland? That was one of my favorites. Wow Raider, you are in an amazing place! An area mom would love to visit, and dad went to once years ago, with his golden named Roxy who did a Mt. Cadallic scramble with dad! Your photos are wonderful! Thanks for stopping by my site!! OMG those were BEAUTIFUL pics!!! I loved them! I've been to Maine many times, but I've never been to Bar Harbor. These pics have made me want to now go...maybe next spring! The entire place just looked stunningly beautiful. Maybe that's why guests keep coming back to this park for it looked amazing and relaxing as well. Every park has its own unique facilities and services that everyone would enjoy. And in our lovely town of Glendale, parks and recreations there are especially made for those people who love sports and who just want to have quality time with their families. Parks in Denver, Colorado is one of my favorite places to hang out to whenever I want to relax and have bonding activities with my family.